On the night that he was elected governor of Wisconsin in 2010, a beaming Scott Walker told the hundreds of supporters sandwiched into Waukesha’s little Country Springs Hotel ballroom that his state was “open for business.” It was shorthand for his promise to slash taxes and lay waste to state regulations, all to create a quarter of a million new jobs by the end of his fourth year in office. But halfway through Walker’s term, Wisconsin had added only a quarter of the promised jobs, it ranked 44th in private-sector job creation, and private-sector wages were falling at twice the average rate nationally. A non-partisan audit of the Wisconsin Economic Development Corp., a job-creation agency Walker started, found it repeatedly broke state laws in its first year. 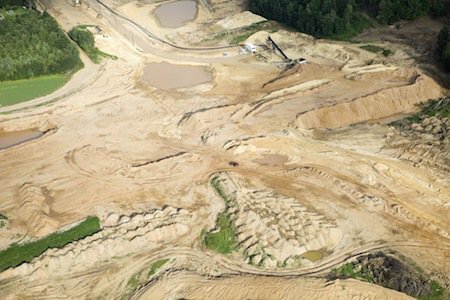 Still, among the detritus of the Republican governor’s job creation efforts, one sector of Wisconsin’s economy has been roaring: the sand-mining industry. The hydraulic fracturing boom that has transformed the plains of North Dakota into an industrial mecca observable from space is fueled by tiny grains of silica sand from southwestern Wisconsin’s hillsides. In fracking, “frac sand” is used to prop open fissures in the earth, creating an escape route for natural gas. A single well can require 2,000 tons of sand over its lifetime. 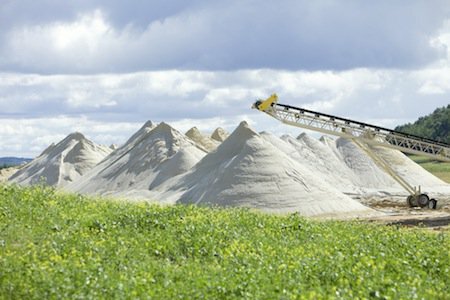 As fracking sites have proliferated across the nation, silica sand mines and processing facilities have too, with Wisconsin far and away the leading provider of frac sand. Just five years ago, there were fewer than 10 sites in the state; today, the state has greenlit a little more than 100, most of which are operational. Rich Budinger, the president of the Wisconsin Industrial Sand Association, estimates that the industry has brought 2,000 jobs to the state so far. Piles of frac sand at the end of a conveyor at a new Wisconsin mine. But public health advocates aren’t so sure about that, worrying instead that the frac sand boom will have broad, lasting environmental consequences for Wisconsin. There is accumulating evidence that mine emissions, when poorly regulated, can be toxic to those who live and work nearby. Frac sand facilities have the potential to ruin groundwater reserves. And local leaders have limited options for regulating the new facilities that are popping up like mushrooms—often because there’s always a town nearby looking to make a buck. Yet the way things stand, with new facilities opening at breakneck speed, any new regulations await conclusive research on the health and environmental effects. And state environmental regulators have neither the time nor resources to ensure compliance with existing law. “It’s certainly hard to wrap your head around the effects,” said Deb Dix, a spokesperson for the frac sand regulation division of the Wisconsin Department of Natural Resources (DNR). “The industry, it’s just so large, so quickly. We’re trying to get all the answers, but it’s just not happening quickly enough.” When those answers finally arrive, will they be too late? The hilly, wooded area of southwestern Wisconsin where frac sand mining has exploded goes by the romantic name of the Driftless Area, so called because it was bypassed by the glaciers that ironed flat the rest of the Midwest during the last Ice Age. “It is the most beautiful part of the state,” said Kevin Lien, the director of the Trempealeau County Department of Land Management. 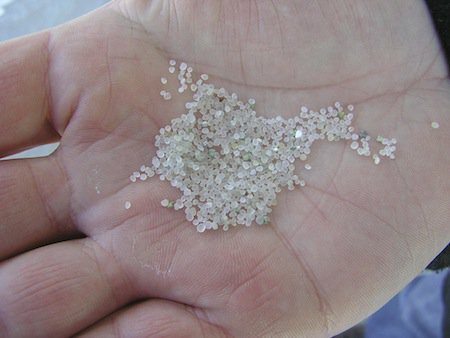 It is also, thanks to its unique geology, the best source in the nation for diamond-strong kernels of silica sand: smooth, round grains of almost pure quartz that can be found in lower Wisconsin’s sandstone bluffs. A close-up of frac sand, the individual grains of which are very hard, round, and chemically inert. An aerial view of a northwestern Wisconsin frac sand mining operation. It’s no surprise, then, that the Wisconsin legislature has been loathe to scrutinize the frac sand industry. In 2012, Democratic state Senator Jennifer Shilling requested that the Republican-controlled Joint Legislative Council, which can authorize research committees, put together a committee to hear testimony and assemble a report on frac sand mining issues. Her request went nowhere. “Nothing happens in this state without the approval and the support of Republican leadership,” she said.2 And those Republicans have campaign donations to consider. A study compiled by the Wisconsin Democracy Campaign found that in the past five years, Republican candidates for state office received more than $710,000 from frac sand interests—15 times what Democrats took in. Walker’s share of that money, in 2010 and in his 2012 recall election, was more than half a million. But Williams, the MEA lawyer, says it’s not feasible for her non-profit to investigate every instance where the DNR might have been trigger-happy with its permits. In fact, the reason why advocates are so focused on reshaping the state’s regulations is that there is very little to stop a company from building a mine once it decides to—not the DNR, and not local officials who often want their town to get a piece of the mining boom. “When they came here, the bars, the restaurants, [they were filled] with the people this industry brings,” said Gary Peterson, the village president when an existing mine in his village, Maiden Rock, doubled in size. Frac sand destined for the oil and gas fields piles up at the EOG Resources Inc. processing plant in Chippewa Falls, Wisconsin. Township officials are getting more sophisticated at cutting deals with mining companies that safeguard their citizens—particularly after word got out that the town of Howard exacted a remarkable agreement from EOG Resources in 2011 to become liable for lost property value and road repairs. But the fact remains that dozens of frac sand mines have been permitted by gatekeepers on county, township, or village boards who had little knowledge of frac sand issues. “At one point in Buffalo County, the board of review was made up of two dairy farmers and a fisherman,” said Vinehout. Parochial officials, she said—some of whom are elected by no more than a few dozen votes—are only as educated about frac sand as they want to be. On the other end of the spectrum are municipal officials who seek to profit themselves from the boom. The Minneapolis Star Tribune found that officials in at least three counties—including Trempealeau, which has permitted more frac sand mines than any county in the state—have gone into business with mining companies. Vinehout recalled that in Arcadia, one Board of Supervisors member used his position to impose heavy restrictions on a proposed mine on a neighbor’s land; a month later, his board colleagues approved a mine on his property to be built by the same company. Lien told of a Trempealeau County land use committee member whose property has been approved, by his fellow committee members, for a frac sand loading site. And although they technically skirt Wisconsin’s bans on quid-pro-quo, frac sand mining companies frequently lavish gifts upon the tiny, penny-wise towns where they operate. “Donations of land for a park, a new firetruck—one of the mines bought elf costumes for the 4H club in town,” Vinehout said. “We’ve had things like that travel back to us,” Lien said. “‘Your kids in your school district will never have to buy sports equipment again.’” Frac sand companies call this acting like upstanding members of their new communities. Their skeptics call this bribery. 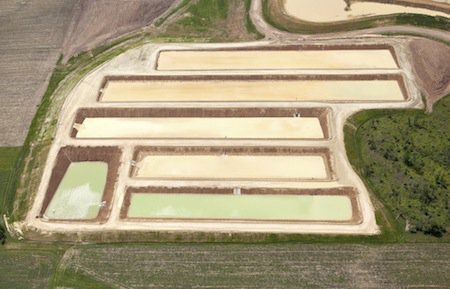 Frac sand washing ponds at a Wisconsin mine. Recently, a similar berm at a different facility failed, further questioning the impact of sand mining. Whether intentional or not, frac sand companies are also creating huge backlogs at the beleaguered local offices that help oversee them by hiring away regulators for their expertise. But the most devious way that mining companies avoid local impositions is through a process called annexation. Wisconsin counties are divided into townships; in each township, some of the land has been incorporated into small villages, while the rest is the township’s alone. Villages have the power to vote to annex land within a few miles of their borders without the township being able to stop them. After five years’ time, the village collects all of the tax revenue from businesses operating on that land. In February, as chronicled by the Star Tribune, the village of Blair leadership did exactly that, annexing the largest frac sand mine in Trempealeau County from the Preston Township. Thus, many of the conditions Preston had exacted from the Pennsylvania-based Preferred Sands—like routine air-quality monitoring—loosened or simply evaporated. “Of course,” said Lien, “the land itself doesn’t pick up and move. The people [in Preston] are still affected—they just don’t have a voice.” By 2018, the tens of thousands in tax revenue the plant generates will transfer entirely to Blair, population 1,366. The words “open for business” are now emblazoned on all the welcome signs greeting drivers as they cross the Wisconsin state line. Fittingly, the first of these to be installed faced southeastern Minnesota, which has refused to engage with what Minnesota Democrats see as Walker’s race to the bottom. This has had the effect of keeping the frac sand industry small and slow-growing. 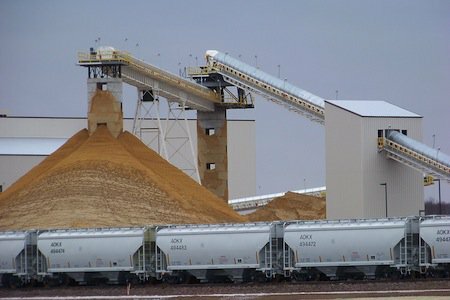 As of April, Minnesota had only eight operational frac sand mines. Few doubt that without Minnesota’s far stricter environmental regulations, they would have more. The EPA has tightly regulated crystalline silica in workplaces for decades, but they do not set ambient, or airborne, standards. Not that Democrats are uniformly worried about the consequences of frac sand mining. Many have other things on their mind. “My colleagues on the other side of the state are like, wait, what is frac sand again?” Shilling said.